There are significant quality and cost benefits when tolerance analyses (stack-ups) are detailed, complete, and most of all reliable. Software technology to perform three dimensional tolerance analyses has been around for over twenty years and offers significant improvements in obtaining meaningful results that can reduce cost of development, recurring costs (COGS), improve quality, and do it all faster. 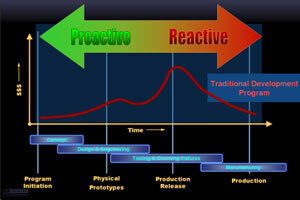 However, there is a road block in using 3D tolerance analysis and that is culture change. Culture change remains the most significant issue when developing new lean and innovative processes within new product development organizations. But change we must in order to maintain a competitive edge. Pressure continues to bear down on designers and engineers to develop more robust design, get to market faster, and not just keep costs down but reduce costs. Well, we have been trying to do that for years and there are many programs put in place, involving significant investments, to achieve the benefits of better, faster, and cheaper. Programs like the popular six sigma process and design excellence initiatives have really helped to change culture in lean development and production while putting more focus on voice of the customer. These initiatives have been working and have accomplished some significant improvements in product development. However, mention GD&T and the need for training and the scramble is on for reasons why the training is either unnecessary or otherwise keep the training to a minimum investment. Fundamental GD&T training is hardly enough to perform reliable detailed tolerance stack-ups. But, any discussion on advanced training in GD&T or stack-up analysis is often tabled for another time. So, it is no wonder that three dimensional tolerance analysis still has not caught on. Organizations typically feel that whatever GD&T practices they have been using for years is working and the same is true with hand calculated 2D tolerance stacks involving GD&T. The questions are; "Is the application of GD&T and tolerance Stack-ups within the organization reducing costs and improving quality the way GD&T is intended to do?" Or, is inappropriate use of GD&T and unreliable tolerance stacks costing time, money, and quality? I believe the later of the two is the reality for many organizations. Replacing 2D hand calculations with advanced 3D software is no different then the culture change that took place to accept 2D CAD and then 3D CAD over the manual drawing table. But there is a difference. People were comfortable with manual 2D drawings and uncomfortable with CAD. For 3D tolerance analysis, we have a situation where people are already uncomfortable with GD&T and more uncomfortable with stack- up analysis using GD&T. The idea of going 3D with tolerance analysis is just another world and makes people more uncomfortable. Well, that's right. 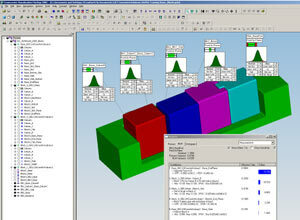 3D tolerance analysis is another world; a better one. The discomfort is obvious in even a fundamental class on GD&T. With a group of experienced engineers who have approved dozens or hundreds of drawings that use GD&T, an instructor can ask a basic question and the class remain silent. Ask for a volunteer to do a relatively simple stack and again no hands. So, no wonder designers and engineers hide behind present day practices. After all, present day practices for tolerance analysis typically do not include a check and approval cycle. The irony is that using a good 3D tolerance analysis tool can actually make designers and engineers comfortable with not only the GD&T but with the results too; Results that are truly value added and help provide more robust design, reduced development costs, reduced part and inspections costs, reduced tooling changes, and reduce time to volume to mention just a few benefits. There is another culture issue. When companies are pushing for more virtual prototyping with CAE in finite element, thermodynamic, fluid dynamic, and dynamic mechanism analyses, three dimensional variation system analysis (tolerance and assembly analysis) keeps getting the lower priority in the product data lifecycle. Why? Well in my college days, I took thermodynamics, fluid dynamics, strength of materials, and the rest of the typical mechanical engineering courses. But, tolerance analysis was not required. In fact, it was not even an elective. I was in engineering for three years before I even heard of GD&T. So, who normally does stack analysis in many companies? The designers are doing hand stacks because the engineering culture is unknowingly taught that tolerance analysis is somehow less significant then the other CAE analysis in use today. I mean who cares if the round peg does not fit into a square hole as long as it is strong and aerodynamic? My point is that when management listens, management listens to the requests of engineers, and since tolerance analysis is commonly not an engineer's responsibility to do (only that it gets done) engineers are focused on the other CAE tools. The culture issue is that designers are often not on an even level of an engineer in a corporate hierarchy. I know this is a bold statement. But it is simple to test the perceived importance of tolerance analysis within a company. Ask these questions. Is GD&T used? Do persons defining requirements with GD&T have certifications such as the ASME GD&T Professional technical and/or senior level certifications or some other real world equivalent experience? Do associates typically attend a three day on site course within which they sleep, answer cell phones and e-mail, and stretch ten minute breaks into thirty minutes? Don't get me wrong. I know professionals, very good professionals that offer these courses. The irony is that an on site course is to reduce time and cost of training when it is the knowledge of GD&T that is supposed to reduce time and cost of producing higher quality product delivered to the customer. Who, if anyone, checks the tolerancing for correct application? This is not the same as signing off on a 2D drawing. That is a whole other issue. Who checks the tolerance stack-up and what are his or her credentials to do so? A personal favorite; "Is the tolerance analysis a requirement in any of the stage gates within a design excellence program and is the analysis put into a release cycle for an approval signature and design control?" And my all time favorite; "Are the black belts, in whatever process excellence program your company may have, required to take even one class, much less be certified, in GD&T?" I know these questions can hit some sore spots; rock the boat. But now go to the people who assemble and test product on production lines. Go to the people who have to inspect components and ask them; "what is the single biggest issue when production assemblies either do not assemble or otherwise do not function correctly?" It almost always comes down to dimensional controls. In particular, production issues come down to not having "knowledge" of specific contributors and therefore impact studies on tolerance deviations are almost useless and home grown tolerance stack-ups are either unavailable or so unclear that the analysis can not be read (sometimes not even by the author of the analysis), or worse the analysis is plain wrong. We know there are huge costs associated with assembly line shut downs, recalls, and customer dissatisfaction, and we know that these costs can be associated in whole or in part to tolerances specifications that are simply not understood. 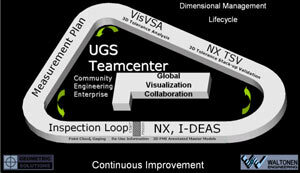 There are many benefits for implementing a 3D tolerance analysis tool like the UGS Teamcenter Visualization VSA product known as VisVSA. When used early on in the detailed design phase of new product development, it can help reduce the number of physical prototypes just as other CAE processes like FEA. Without valid tolerance analysis prototype parts are received and changes are physically made to features to get prototypes parts to assembly and/or function. Often, the dimensional issues result in prototype tool changes resulting in additional physical prototypes, time, and money just to get a design assembled and functioning for further verification and validation. With VisVSA 3D tolerance analysis, thousands of virtual engineering builds can be performed using Monte Carlo simulations and tolerance iterations can be performed quickly based on each set of results to optimize the design for function with optimal tolerances that allow for easier lower cost manufacturing with better capability to clear, concise, and valid requirements. Another major efficiency that a 3D tool like VisVSA offers is the ability to virtually change the nominal CAD data, without corrupting or actually changing the CAD model, and then quickly analyze iterations of nominal changes along with tolerance allowances. This is a superior process to going back to the 3D CAD model; Change it; then translate the data over to a supplier to change a prototype tool and get new first shots, in weeks, only to find out the guess was wrong. After a proper VisVSA analysis, or virtual impact study, 3D CAD models can be changed efficiently with more reliability for a successful improvement. Tolerance libraries that re-use the knowledge of known manufacturing capabilities based on material, process, and supplier can be developed that in time speed the dimensioning and tolerancing, as well as the analysis, resulting in better product definition. Is time efficiency in dimensioning and tolerancing important? It certainly is. Dimensioning and tolerancing for most companies is typically the antiquated process of doing drawings; the "legal" documents so I have been told over and over and over again. Creating drawings is already a waste of time, but when tooling is delayed waiting for a drawing, the dollars add up fast. And if the drawing changes six or seven times, the dollars add up faster and release of product slows down. The root of most drawing issues is the creative re-design of GD&T and guessing tolerance requirements that should already be known and valuable company assets. Maybe the single biggest advantage to design and process excellence programs is the gain in consistency. When teams work in a similar and consistent process, companies gain huge efficiencies in managing their resources and product development can realize continuous improvements because process errors or inefficiencies will also be consistent, easily identified, and improved upon. Using a consistent method and tool for tolerance analysis will yield similar results where hard dollars can me measured. Gains in consistent use of GD&T can be spectacular. The reduction of team player conflicts that constantly surround the application of GD&T can me reduced not only in time but turned into real value added inputs to product design; not to mention a much improved work environment. Is retention of good talent on any company objectives list? I think so. And, in time, persons wanting to do 3D tolerance analyses will become in high demand. Persons who know 3D tolerance analysis will be in higher demand. This paradigm is true today with 3D solid modeling compared to the manual drawing table. Ultimately culture will change to a point where a company not using 3D tolerance analysis tools will have difficulty in recruitment for persons to do such analysis. And yes, I am saying that the role of tolerance analysis not only will be but is a specialty; no different from FEA or other CAE tools. In the day, we called them checkers. Many companies eliminated drawing checkers to lean out some of the new product development process. The problem with the drawing checker system was/is that there were huge delays in releasing drawings typically for non-value added reasons like the font of some lettering or re-arrangement of dimensions and or views that would make the drawing look better. But checkers often did some random stack-ups that sometimes had real value. What if such stack-ups were not so random? What if there was a focused requirement for documented, controlled, reliable, and reusable tolerance stack-ups? What companies needed to do, and still need to do, is eliminate the non-value added details of a 2D drawing and develop the checker role into a dimensional management specialist. The best part about a fundamental, natural, and necessary culture change is that voice of the customer demands it. In world competition to develop world class product, the demand to get there better, faster, and cheaper has not and never will change. After I read your message, I decided to let you know my experience with tolerance stackup. You are right on talking about the engineering culture and practice. However, I sadly say that tolerance analysis is not a solid engineering/science yet. Take a look at visVSA manual or training course books, there are all the detailed steps how to build a model and get results. THERE ARE NO THEORETICAL BACKGROUND mentioned. If you want to compare VSA with FEA, you can check all major FEA software manuals and you will notice the theoretical manuals there. I don't understand why visVSA does not provide its theory. You can image if I just follow you without understanding what the software is doing behind, I will not and can not go far. In my practice with visVSA, one of difficulties is the judgement of the results. How do I know I got issues in my models. I prefer thinking the issues with my models, instead thinking the bugs in the software. What will happen if we do have a bug ! in the software? How do I know? Yes, technical support there. How much time is needed. In industry, how many chances we have to report to management about the "trooubled" results? 10 of 13 found this review helpful. Here's another example of halfway into the article, I could guess who wrote it. Hot Dawg - it's Norm stirring the pot again and making us think! I was a drafter for 10+ years before being introduced to GD&T in 1990. That was more than 10 years of working alongside engineers who must also have not known or cared about GD&T, let alone stack-up analysis. (When I think of the countless hours of handlettering paragraphs of notes for runout, TIR, etc, and how GD&T symbols would have been so much simpler, I still roll my eyes & shake my head). It's a long in-grained culture that is resistant to change, but the hope is that people comfortable with 3D design will also champion 3D everything else, & they eventually will _become_ the culture. 26 of 33 found this review helpful.